Since I live in New Jersey, it’s been some time since I’ve been to Pomegranate, the gourmet kosher supermarket in Midwood, Brooklyn. (1507 Coney Island Ave. at Ave. L). 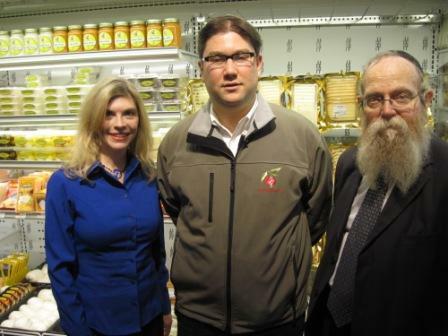 Yesterday I went with Chaim Szmidt of the Kosher Scene blog and we spoke with Pomegranate’s General Manager and Cheese Expert, Gabe Boxer about what is new and exciting in the cheese case and in the specialty kosher world. 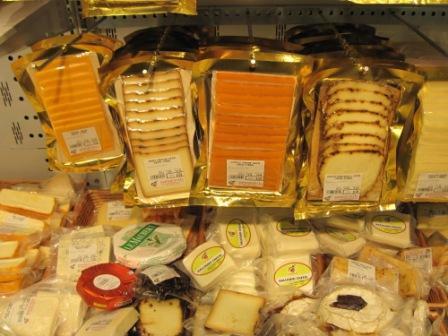 Pomegranate boasts two cheese cases–one with pre-packaged and highly hechshered domestic kosher cheeses and the other with store-packaged imported cheeses as well as Pomegranate’s own cheeses packaged in the store–all under Pomegranates Kehilah Kashrus certification and cholov Yisroel. 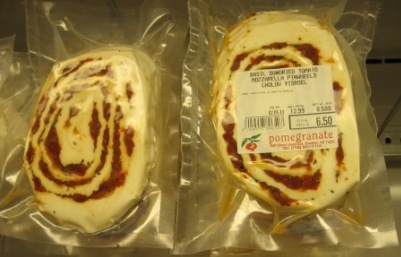 When Rabbi Szmidt told me Pomegranate made cheese, I assumed he meant fresh mozzarella, but the store does much more. They work with curds on the premises and make firm cheeses, too, ranging from olive-speckled slices to sundried tomato cheddar in chunks ready for the cheese tray. They also make traditional fresh mozzarella which is available plain in large balls or in bocconcini marinated for an antipasto or with chili peppers. This case had everything one would want for a kosher cheese party. One of my favorite innovations were the thin-sliced (and meticulously packaged) mozzarella rolls available with sundried tomatoes or smoked salmon. Pomegranate is a vibrant store; as I studied each cheese case, I watched baskets, shelves, and racks being emptied by customers and quickly restocked by employees. One minute there was a basket of Argentenian Reggianito, and the next, it was full of specially selected Danish blue cuts, Spanish Manchego, and French Lomont. The pre-packaged domestic area also offered an abundance of standard choices and specialty domestic items. 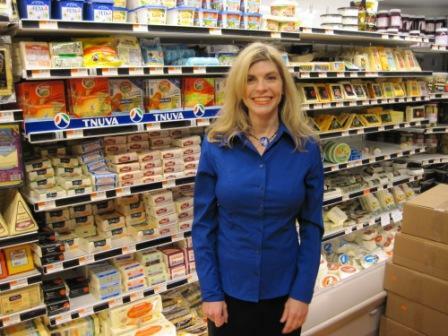 It’s National (Kosher) Cheese Lover’s Day!